Penfield residents Carina, left, and Adriana Scalice, right, practice using pipettes during the Center for Bioscience Education and Technology camp, DNA Detectives. Professor Dina Newman introduces the sisters to Ritchie, who played a role in the weeklong camp for middle school students. The science “bug” can be catchy, especially if the conditions are right: an enthusiastic instructor, hands-on experiments and science made fun. Middle school students learned about genetics while playing junior crime scene investigators during DNA Detectives camp, July 25–29, offered through RIT’s Center for Bioscience Education and Technology in the new Institute of Health Sciences and Technology. The students, ranging in age from 10 to 13, learned how to extract and analyze DNA through a series of small exercises before applying their newly honed forensic skills to nabbing a fictitious criminal. Thanks to popular television programs, the concept of DNA has captured the imagination of many teenagers. CBS’ CSI: Crime Scene Investigation inspired a table of four young women to sign up for DNA Detectives. “I want to be a forensic scientist when I grow up,” says Kayjona Rogers, a ninth grader from Penfield, citing a passion for CSI, science and math. Now in its fifth year, the center’s bioscience exploration summer program has begun to advertise itself. “This is the first year we’ve had returners,” notes Faye Modeste, assistant to the center’s director. The center launched its bioscience camps in 2007 with three weeks of instruction led by Chris Widmaier, a science teacher at World of Inquiry School in the Rochester City School District. This year, the center offered seven weeklong camps to 72 middle and high school students from the area. In 2009, a scholarship program was made available through the M.H. Yager Foundation, the Rochester Area Colleges for Excellence in Math and Science, and Excellus BlueCross BlueShield, which supports many of the center’s educational outreach efforts. Since then, more than 35 disadvantaged or underrepresented students have received partial or full scholarships to attend science camps at CBET. Some of that enthusiasm was evident in the DNA Detectives camp when Newman surprised her 12 detectives with a mystery involving RIT’s mascot Ritchie, who—hypothetically—disappeared under suspicious circumstances. The students solved the mystery by assessing the crime scene and comparing DNA from the five suspects. They deduced the kidnapper’s identity by analyzing dental impressions and DNA samples from a mouth guard left at the scene, cotton fibers stuck to the mouth guard, a handwritten note and leaves from a non-native tree. The camp concluded with a mock trial and the conviction of a fictional student from the University of Connecticut who had taken the RIT mascot when his transfer was rejected. 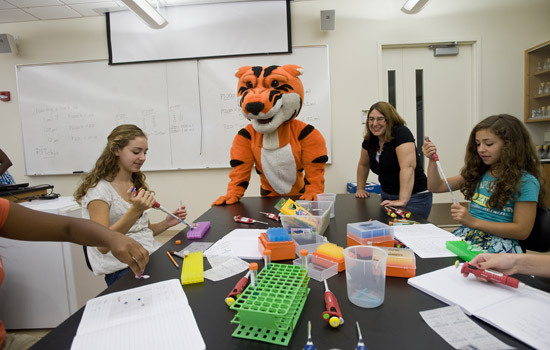 For more information about the Center for Bioscience Education and Technology, go to www.rit.edu/cbet.